Ok, admittedly this is NOT my favorite subject. Like, at all. I have a healthy and overwhelming hatred of bugs. I'd just as soon they not exist. Yes, I am well aware that they have purpose. But why do they have to be so ugly and creepy? Can't they be pretty with purpose? And can't they know to stay away from me at the same time? That'd be nice. Even though I do not like bugs, I do like Workman's books for kids. Everything I've seen is just really unique. (This is the same company that publishes the Sandra Boyton books that I think are oh so hilarious.) Their bug things (I say with fear and trepidation) are pretty cool. For being bug things. First we have the Bugs Fandex . It's not a book but rather they are information cards, each focusing on a particular insect and filled with information about said bug. At the top of each card is a shape cut-out of the bug. We used this Fandex to get our son to eat his dinner. (He was convinced he didn't like dinner and needed a distraction.) We pulled out the cards and we would slide them down, one at a time, revealing new and disgusting bugs, per bite. Take a bite, turn down a card and see a new bug. (This is a method and mode of bribery that would never have worked on me.) I'm not sure how anyone can actually swallow a bite of food while staring at a dung beetle but apparently, if you are two, and if you are a boy, it's possible. Each "field card" contains information on both the front and the back. The cards tell you where each bug can be found in the world (so that I know which countries to avoid), what its scientific name is, what their life cycle is, along with other general information about each bug. This is certainly a unique look at bugs. My son liked it. We'll leave it at that. Do note that if you are a creationist, these field cards take the opposing view. However, beyond the first card which introduces you to bugs and their origins, I didn't really note any other references within the cards themselves. (I checked.) It's easy to skip. 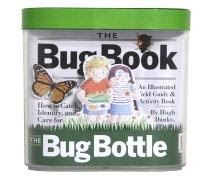 Next up we have The Bug Book and Bug Bottle which I imagine every mother will be thrilled about. (Ok, seriously. I'm poking a bit of fun because I truly have a fear of bugs. However, I also acknowledge the fact that it is not a good idea to pass along my very rational fear to my son so that he can also be very rationally afraid. This is a totally a daddy subject but mommy writes the blog so here you go!) THE BUG BOTTLE! I have to say this kit is cute. It comes with a bug book which tells you how to locate bugs (and where they've been), a bug journal because you know you want to keep notes about every bug you've ever seen, a classification chart to pin on your wall and stare at as you fall asleep at night and a magnifying glass so that you can take a look at the little crusty creatures cuties. BEST YET! It comes in a plastic container with holes at the top so your young ones can catch bugs, help them to continue breathing and living, and house them. I just love it, I do! But for $11.16 (on Amazon) - if I had a young boy (like I do) who likes bugs and can abide by the "we only catch lady bugs and fireflies" rules, then I would SO get this package before summer rolls around and bugs are out and about. This kit/set is really very well done, high quality, and the lid doesn't make me too nervous. It latches on tight. Interested in bugs? These are two useful things. If I have to like them, I do, but I'll let my son speak on my behalf this time. His response? "OH WOW!" Now you and YOUR children (maybe just your children?) can also have a chance at saying, "OH WOW!" Workman Publishing is generously giving away one Bugs Fandex and one Bug Bottle to one of you. To win? Leave a comment. Make sure you leave a valid e-mail address for me to contact the winner by! Contest open to U.S. Residents only. The contest will close on Friday, May 8th. My kids are so fascinated with creepy crawlies...thanks for the giveaway! I think this is something that my daughter would love. Thanks for the giveaway. My sister got my son a bug-sucker (glorified see-through dust-buster) for christmas, so these would be great to use with it! We love fandexes... have 3 already. None as cool as one on bugs! Thanks for the chance to win! That could be fun! I Love bugs! My preschool students always told everyone that you don't kill the bugs, you release them. My sone just squishes them and says they are EWWWWW! Yucky! I'm not a fan of bugs. My daughter, on the other hand...She's very much into worms lately. Yuck. She killed a spider by herself the other day, so I'm hatching plans of training her to be my resident (when Daddy's at work) bug-killer. My girlies LOVE, LOVE, LOVE bugs. They already have bug boxes (one of which currently houses a HUGE grasshopper and a ladybug, unless she's flown the coop). These things would be a great addition to our collection, though. Glad to see you posting again, Carrie! You were missed! My sons would think this is great! After all, boys aren't afraid of bugs at all! This would be great for my son who is fascinated with bugs. Thanks. I'd love to win this! My daughter would have such a great time with it. Thanks for the giveaway! My son loves this and so he can learn from bugs.